1) Fill out the form below and Submit it. 2) E-Mail the staff member (if you didn’t get banned by a bot) that banned you, or Victor (gtaxl@gtaxl.net Owner) using the proper appeal procedure. 3) Wait the ban out. Please note: This ban appeal page applies only to a network-wide ban. GTAXLnet staff cannot remove channel-based bans. If you were banned from a channel, you would talk to the channel owner for a resolution. You could also check to see if they are in #GotBanned and appeal the channel ban there. If you were banned from a GTAXLnet services channel, such as #GTAXLnet, #vHost, #IdleRPG, then you would appeal that ban in #GotBanned. To find out the channel owner, type /msg ChanServ INFO #channelname and look at Founder. If you choose the E-Mail option, you MUST follow a specific procedure. 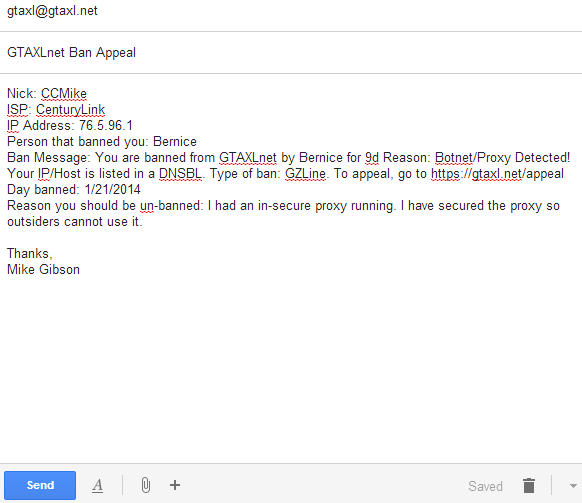 If a bot (Bernice, PScan, services) bans you, you must only e-mail Victor. Other staff cannot remove bot/services based bans. If the ban message does not specify who banned you, then you would e-mail Victor as well. To get a staff member’s e-mail address, check out the Staff Directory. Once you know who you’re sending the e-mail to, you now type the e-mail in the following structure. IP Address: (You’re IP address, or the one that was affected) You can find out your IP address by clicking here. Ban Message: (Copy and paste the ban message, exactly as you see it when you attempt to connect to GTAXLnet.) If you’re client doesn’t display this information (almost ALL do) then provide a screenshot. You can use the Windows Snipping Tool and copy and paste. Day banned: (What day you was banned. In this format. Month/Day/Year) If you don’t know approximately, give an educated guess of around..
Reason you should be un-banned: (Explain why you feel the ban was an error or why you feel you should be allowed back on the network.) This is optional, but can help your chances of your appeal being accepted. Click here to view an example E-Mail ban appeal. Please put your e-mail address so we can get back with you. Put the IP address that was affected by the ban. Whether it be an IPv4 or IPv6 address. How did you connect to GTAXLnet? Check all that apply. *Are you a registered user on GTAXLnet?